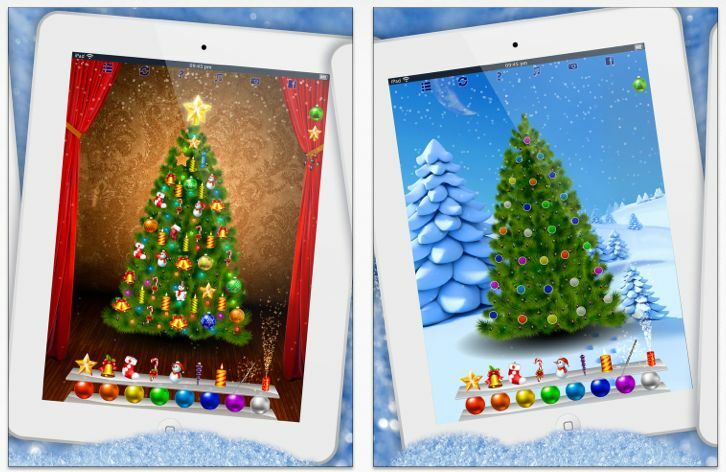 Xmas Tree HD, is an app that lets you design the ultimate Christmas tree right from your iPhone, iPod Touch, or iPad.There are tons of ornaments to choose and you can position them anywhere you like. There are 3 game modes: Free decoration, Match It: colors, Match It: shapes. The Free mode allows children to get creative, while the match it mode helps them to learn shapes and colors. This application is perfect for children of all ages. There are multiple ornaments to choose, multiple different tree types, and multiple Christmas songs to listen to while you are decorating. Once you are satisfied with your tree, you can snap a photo of it and save it to your camera roll or upload it directly to Facebook. This is a great application for young kids to get creative and to keep them busy for hours while they sing along to the Christmas songs. It is a universal application meaning you only have to purchase it once and can access it on all of your iOS devices. Currently the app is priced at $0.99 but if you email crew@starshipstudio.com, they may just send you a coupon to download it for FREE!